Rising from the abandoned ruins of the Pennsylvania Railway Embankment in Downtown Jersey City, the Liberty Bridge would extend up and over the Hudson River and into Lower Manhattan. Accessed by foot or bike, the bridge would provide an elevated park experience with unprecedented access and views of both cities for commuters, residents and tourists alike. The bridge is envisioned as a pair of interwoven paths contained within a box truss frame. The paths are unique in their use and materiality with concrete handling direct, express movement for commuters and wood accommodating more leisurely outings. The paths are woven together horizontally and vertically with their relationship to each other reinforcing their use. The lower level concrete path is partially protected from the elements by the upper level wood path to help facilitate more pleasant, weather protected commuting. Meanwhile, the more exposed wood path takes advantage of dramatic views and an outward focus. Strips of vegetation and integrated seating would provide inviting buffers between the mixed uses while intermittent cafes and shops would generate additional vitality. 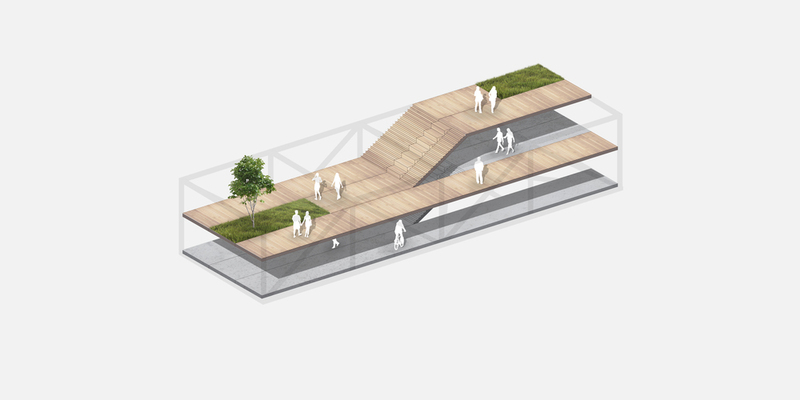 The result is a 5,000 foot long, 200 foot high pedestrian park linking two great cities. Liberty Bridge is a concept envisioned by Kevin Shane @stogiemonster.